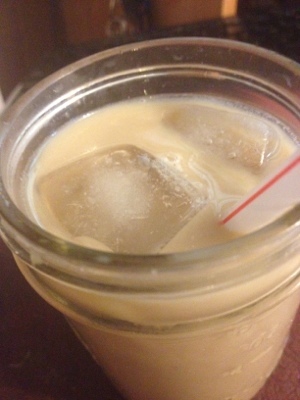 In 2007, I was introduced to a drink called iced coffee. My sister and I went to Pittsburgh for my paternal grandma’s funeral and I remember driving 2 different McDonalds trying their iced coffee. It was there I discovered their iced coffee was too sweet for my liking. My favorite place to get iced coffee is Tim Horton’s. You can customize it to your liking. I think that school year I stopped at Tim Horton’s almost everyday. I’ve now stopped going there as often. I’ve seen different recipes on how to make the concentrate. I decided I needed to try it out and was pleasantly surprised with how well it turned out. Warning: It takes 10 to 12 hours for the concentrate to “brew.”. Then it takes a while for it to strain to get rid of the coffee grounds. But it’s totally worth the wait. Put ground coffee in container. Pour 32 ounces of cold water over ground coffee. Put container in fridge or on the kitchen counter for 10 to 12 hours. Slowly pour the coffee into the colander. Place the concentrate into another container. Refrigerate the concentrate for up to a month. I use 4 ounces of the concentrate. I add 2 ounces of milk and a little bit of creamer and then a few ice cubes. Lastly I shake it up or stir it up. Then I enjoy my creation.